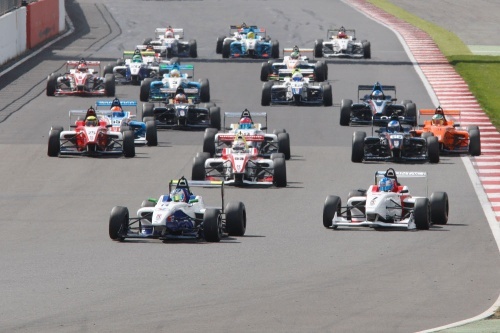 MSV has announced plans for a BRDC F4 Winter Series to take place in November this year, comprising a total of eight races over two weekends at Snetterton and Brands Hatch. The F4 Winter Series will commence on 9/10 November at the Snetterton 300 circuit in Norfolk, and will conclude on 23/24 November on the Brands Hatch Indy circuit in Kent. Each day will feature a 20 minute qualifying session and two races of 20 minutes duration, meaning a total of four races per weekend. Teams and drivers will also be able to take advantage of a semi-exclusive test day aimed at F4 competitors on the Thursday preceding each event, while a general test day on the Friday will offer up to three hours additional running. The Winter Series will allow teams to evaluate new drivers whilst offering additional mileage for those 2013 drivers remaining with the championship for a second season. F4 Series Director Jonathan Palmer confirmed: "It is clear that BRDC F4 championship's first full season is going to be a great success so the teams are keen to have a winter series both for current drivers continuing in 2014 and in order to evaluate new drivers. “We have consulted with the teams regarding the format and are delighted with the resulting comprehensive package that will provide exceptional tracktime and value for drivers."